Tanya Angus, from LA USa, was a pretty young woman, tall and slander, and looking good and attractive in her swimsuits. Until the age of 21, she was reasonable tall at 5ft and 8 inches, weighing just 130 pounds. But then her life started to change. And in next 13 years she had grown 6ft and 11 inches tall weighing 400 pounds, suffering from one of the world's worst cases of gigantism. It was a tumour became wrapped around her pituitary gland, causing massive amounts of growth hormone to be released into her body. 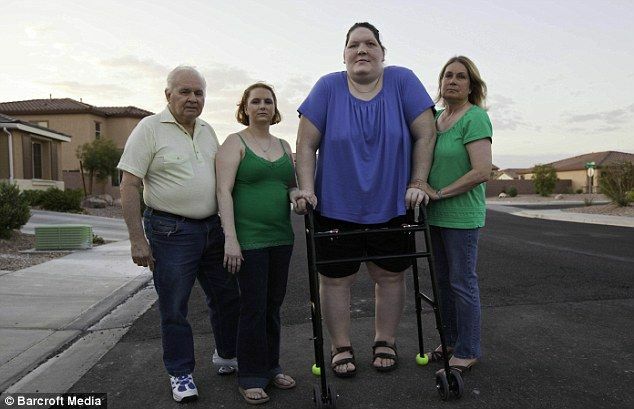 Her excessive weight bounded her to wheelchair and even if she wanted to walk, she had to do it with crutches. She ran from pillar to post for treatment, underwent surgeries but it was August last year when a blood test revealed that her growth hormone levels had fallen at last. The good news was short-lived. Tanya's Insulin-like Growth Factor levels, which had fallen from 3,000 at the worst of her condition to just 283, had started to creep back up into the 500's. The normal range for a healthy person is around 250.It is thought the extreme pressure on her body, caused by 12 years of coping with her huge size, caused her heart to fail. And at age 34, she suddenly died at 12.25 am January 14, 2013, due to her heart and TIA.